Criticism is growing of a Brazilian police operation to clear some 6,000 people from an illegal settlement in Sao Paulo state. Officers moved in on Sunday to retake the land for its private owners. Authorities say the police action was justified and within the law. Amnesty International said the eviction violated "a raft of international standards" and urged officials to urgently address the needs of the families left homeless. The events at the Pinheirinho settlement were part of an unfortunate pattern, said Atila Roque, director of Amnesty in Brazil. "As the country booms, tens of thousands of poor families are being removed to make way for infrastructure and private development projects, without receiving adequate protection and alternative housing," he said. 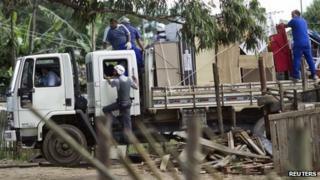 Brazil's landless movement (MST) condemned the police action as an "act of war". There was also criticism from other quarters, including from a senior official in the presidency, Gilberto Carvalho, who described the scene as a "battlefield". This provoked a strong reaction from the Social Democratic Party (PSDB) which runs Sao Paulo's state government, as "intrusion by the federal government". The evictions followed a legal battle between the residents and administrators for the bankrupt property company that owned the land. The Pinheirinho squatter camp was established by a land invasion in 2002 and had developed into a settled neighbourhood, complete with shops and churches. The legality of the operation to clear it has been questioned. Judge Rodrigo Capez, who accompanied the police operation, said that the law had been followed as the residents could not be consider to have acquired rights over the land. Mr Capez told BBC Brasil that people had not been informed in advance in order to reduce the level of resistance. "It was exactly the surprise element that minimised the risk of deaths or injuries," he said. The government was attending to the needs of the people as regards alternative shelter, he said. Sao Paulo officials say that clashes broke out after the site had been cleared. On the ground, the situation remained tense, with a continued police presence. Officials have been cataloguing and removing furniture and other belongings to be stored and then returned to their owners.